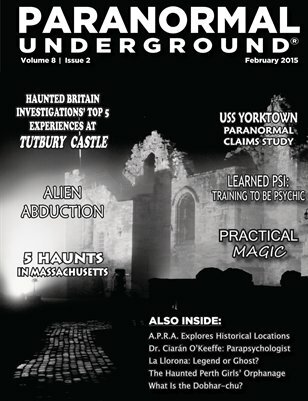 In this issue of Paranormal Underground magazine, we spotlight parapsychologist Dr. Ciarán O’Keeffe, the American Paranormal Research Association, and William J. Hall, author of “The World’s Most Haunted House.” We also feature paranormal tales from Tutbury Castle, alien abduction, tests of the Seek thermal imaging camera, the cryptid known as the Dobhar-Chu, the legend of La Llorona, and the hauntings at the Perth Girls’ Orphanage. Other columns cover a paranormal claims study on the USS Yorktown, training to be psychic, haunted hotspots in Massachusetts, and love/hate magic, plus more. For a PDF download or 12-month digital subscription to Paranormal Underground magazine, visit www.paranormalunderground.net!